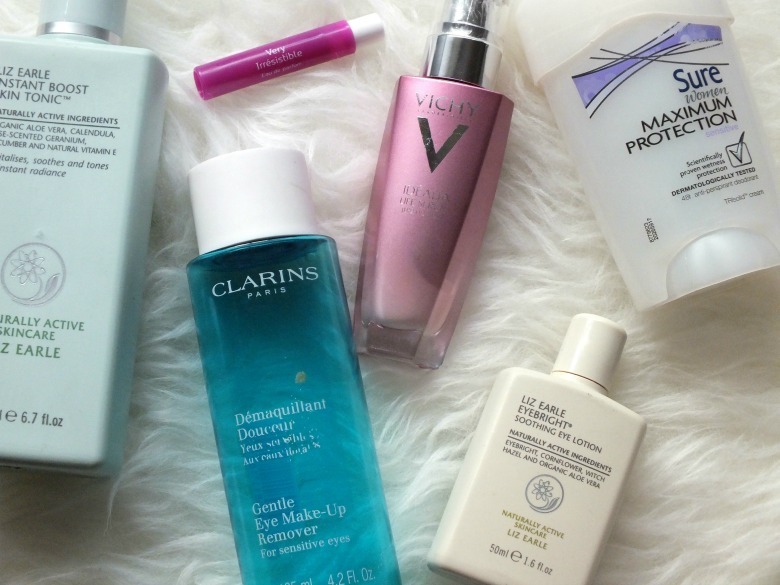 My pile of empties for February is very skincare heavy with some new and old favourites so let's dive in so I can get this pile of bottles thrown away. Unless we're talking exfoliating toners not too other's are seen frequently popping up in blog posts so I tend to always gravitate to what I know and that's Liz Earle Instant Boost Skin Tonic - especially now it's available in Boots. I've spoke about this toner before so you'll know it's a favourite and will obviously repurchase (in fact I already have) but if you have other recommendations do leave them in the comments. This is a slight empty 'cheat' as I found this bottle when I was moving furniture from my bedroom but I fear it could've been hiding for some time. I haven't repurchased this recently as I find it's more suitable in the Summer when I'm suffering from hayfever eyes but there have been one or two mornings lately when I wished for this to give myself a jolt in the morning. This was a 'meh' product for me. It did what it said on the tin but I didn't find for it's price tag it was any better than L'Oreal's offering. In fact I often found that when I used this I had that glassy film over my contact lenses which no one likes. This year I'll save myself a few pennies and stick with the drugstore versions. I was given this serum to try following a launch event I attended last year and was gutted when the final drops disappeared from the gorgeous pink packaging. This serum has a lovely light gel like texture which instantly boosted my skin that it was a go to in the mornings. Practically marketed just for me as someone who gets little sleep, drinks, smokes and does everything bad for you this luxe bottle helped me from looking like I had only managed a few hours sleep on many occasions. This is must repurchase from me although it will have to be with some advantage card points as I'm on a major spending ban right now. A product you're probably sick of me talking about having reviewed it here and repurchased it here so I think we'll leave it as I'm a fan and this is my go to deodorant. I can't even begin to describe fragrances beyond I did/didn't like it and it's either floral or strong. I've just hopped online to have a look at some better descriptions of it's scent (aromatic floral) and I'm not surprised I like it, I definitely think this could be one for my Duty Free shopping list. This handy sample size was thrown in my make up bag and came in very handy on a couple of occasions when I forgot to put perfume on before leaving the house. Two Lush products bit the dust this month, The Comforter which I've already talked about here and the Fizzbanger Bath Ballistic. The Fizzbanger was purchase purely for amusement and it did just that. I'm not sure I'd repurchase again but it was fun to enjoy the product whizzing around the bath and spilling out it's turquoise blue lava. Exactly, I'll also be giving up including it as a repurchase!! The Vichy serum is lovely, nice texture and scent as well as positive results. I feel like I need to give it another try! Funny enough, I just used up the same perfume sample this very day! Smells really nice! I still haven't tried any Liz Earle, I feel I really should! I've used a lot of Clarins eye make up remover although my most recent purchase is very oily and less effective, not sure if they've changed it or if there are 2 and I bought the wrong one! My go-to eye make up remover however is the Body Shop Camomile remover, and it's a lot cheaper!